Sarah is a PhD Candidate in the Applied Social Psychology Program. 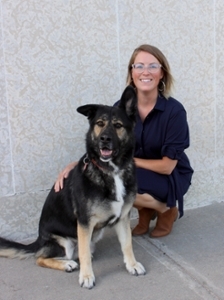 Originally from Saskatchewan, she completed her BA (hons) at the University of Regina in 2012. She moved to Saskatoon to work with Dr. Lawson for her graduate work and completed her Masters in Applied Social Psychology in August 2014. Her Masters thesis investigated how Canadian print news constructs infertility and how that construction affects consumers of this news. For her dissertation, Sarah is investigating the experience of receiving a pre- or post-natal Down syndrome diagnosis in order to develop an understanding of how parents make meaning of this experience. She is also assessing the extent to which these experiences align with best practice recommendations for the relaying of diagnoses. The results of this research can inform policy by providing recommendations regarding the strengths and weaknesses of historical and current diagnosis practices and informational resources provided to parents during the process. Her research interests are focused generally around experiences with the reproductive health care system and reproductive decision-making. Sarah also works with public, private, and non-profit organizations as a program evaluator. She is vice president and chair of the professional development committee for the Saskatchewan chapter of the Canadian Evaluation Society. Williamson, L., Sangster, S., Bayly, M., Gibson, K., Lawson, K., & Clark, M. (2017). A needs assessment on addressing environmental health issues within reproductive health service provision: Considerations for continuing education and support. Canadian Medical Education Journal, 8(4), e65. Sangster, S., & Bayly, M. (2016). “Anarchists”, “naturalists”, “hippies”, and “artists”: Beliefs about midwifery care and those who choose it. The Canadian Journal of Midwifery Research and Practice, 15(2), 38-46. Sangster, S. (2018, May). Do we serve evaluation when we contrast it with research?. Flash presentation at the 38th Annual Canadian Evaluation Society Conference, Calgary, Alberta. Sangster, S. & Lawson K. (2018, May). Evaluation and Research: Two sides of one coin or different kettles of fish? Oral presentation at the 38th Annual Canadian Evaluation Society Conference, Calgary, Alberta. Sangster, S., & Lawson, K. (2017, September). “A lot of us that don’t have high functioning kids get silenced”: marginalization within the Down Syndrome community. Poster and flash presentation at the 37th Annual Society for Reproductive and Infant Psychology Conference, York, UK. Williamson, L., Bayly, M., Sangster, S., & Taylor, A. (2017, May). Collaborative evaluation and capacity building with grassroots organizations: Reflections on competent evaluation practice. Oral presentation at the 37th Annual Canadian Evaluation Society Conference, Vancouver, British Columbia. Sangster, S., Duerkson, K., Bayly, M., & Lawson, K. (2016, September). Women’s attitudinal, control, and normative beliefs about delayed childbearing. Poster and oral presentation at the 36th Annual Society for Reproductive and Infant Psychology Conference, Leeds, UK. Bayly, M., Duerkson, K., Sangster, S., & Lawson, K. (2016, September). “Later, baby!”: Age-related attitudinal differences toward delayed childbearing. Poster and oral presentation at the 36th Annual Society for Reproductive and Infant Psychology Conference, Leeds, UK. Couture, J., Sangster, S., Williamson, L., & Lawson, K. (2016, June). Pregnancy Termination: It’s All About the Context … Poster presented at the 77th Annual Canadian Psychological Association Convention, Victoria, BC. Clark, M., Bayly, M., Gibson, K., Sangster, S., & Williamson, L. (2015, October). Maternal and infant environmental health: What do health professionals and service providers need? Oral presentation at the Prevention Matters annual conference, Saskatoon, SK. Sangster, S., Bayly, M., Lawson, K., Krosnick, J., Silber, H., Stark, T., & Blom, A. (2015, September). A national survey of Canadians attitudes towards midwifery. Poster presented at the 35th Annual Society for Reproductive and Infant Psychology Conference, Nottingham, UK. Sangster, S., Fick, F., Gibson, K., & Lawson, K. (2015, September). A qualitative analysis of young adults’ beliefs about parenting and remaining childfree. Oral presentation at the 35th Annual Society for Reproductive and Infant Psychology Conference, Nottingham, UK. Williamson, L., Couture, J., Sangster, S., & Lawson, K. (2015, September). The differential impact of social perspective on women and men’s endorsement of abortion. Oral presentation at the 35th Annual Society for Reproductive and Infant Psychology, Nottingham, United Kingdom. Bayly, M., Sangster, S., & Lawson, K. (2014, November) "Baby in one hand, mop in another": A Qualitative Analysis of Young Adults' Beliefs About Midwives. Poster presented at the 13th Annual Canadian Association of Midwives Conference, Ottawa, ON. Sangster, S., & Lawson, K. (2014, September). The Framing of Infertility in Print News: A Content Analysis. Poster presented at the 34th Annual Society for Reproductive and Infant Psychology Conference, Valletta, Malta. Sangster, S., & Lawson, K. (2014, September). The Effects of Alarm Frames on Consumers of Infertility News. Poster presented at the 34th Annual Society for Reproductive and Infant Psychology Conference, Valletta, Malta. Sangster, S., Bayly, M., & Lawson, K. (2014 September). “People Who like Organic Food or Go to Yoga”: Young Adults’ Beliefs about People who Choose Midwifery Care. Poster presented at the 34th Annual Society for Reproductive and Infant Psychology Conference, Valletta, Malta. Williamson, L., Sangster, S., & Lawson, K. (2014, June). “Hey girl…”: The Effect of Ryan Gosling Feminist Memes on Feminist Identification and Endorsement of Feminist Beliefs. Poster presented at the 74th Annual Canadian Psychological Association Convention, Vancouver, BC. Sangster, S., & Lawson, K. (2013, November). Midwife Assisted Births: Fine for you, But not for Me. Poster presented at the 13th Annual Canadian Association of Midwives Conference, Ottawa, ON.